With a firework display in the evening and a tug of war of the local people and visitors who want to participate. 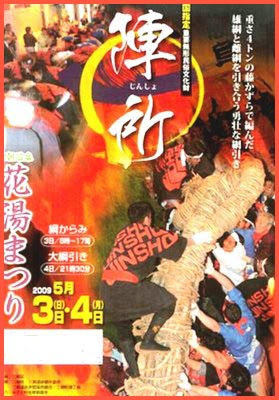 The famous rope is made of visteria wines (fuji kazura 藤かづら) and very large. It is kept in the shrine Misasa Jinja 三朝神社 in a special museum. This is an event to divine the outcome of the year. there will be a good harvest. it will be a good year for business. If you use the hot radiuim water of the hot springs, you will be healed by the third morning ... or so they say. 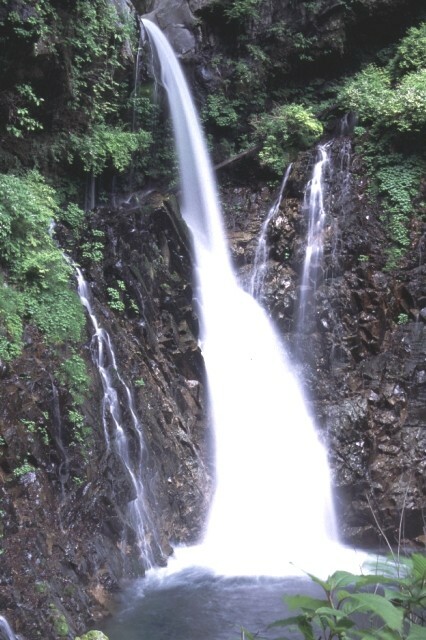 is located at the center of Tottori along the Misasa-gawa River, southeast of the center of Kurayoshi City. It has long been known as a representative health resort and therapeutic bath in the San'in region. Kawara-buro, the open-air bath on the river beach near the bottom of the bridge, is a symbol of the Misasa-onsen where you can enjoy the atmosphere and rural life. 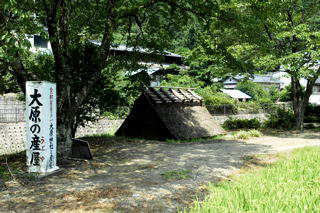 In the neighboring areas is Mitoku-san Sanbutsu-ji Temple, a sacred ground for mountain Buddhism. As you climb the rugged mountain path, which takes about an hour, you will see the Nageire-do, or "thrown-in temple," in a hollow halfway up the precipice. Legend has it that a practitioner of asceticism threw the temple up into the hollow from far down below the cliff. Even professional architects have been unable to determine the building method of this structure. Monju-do and a bell tower with a fine view are located along the approach way. You can also enjoy the local specialty - wild vegetables and 'tofu' (soybean curd) dishes at the restaurants in front of Sanbutsu-ji Temple. Her statue is at Misasa Hot Spring. On the 15th day of the first lunar month, in the full moon night. This ritual was performed to tell the fortune for the harvest in the coming year. If team A wins, there will be a lot of fish and a good harvest.
. 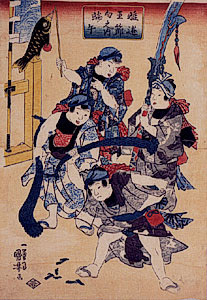 Autumn Festivals - SAIJIKI . The three lunar months of 1, 5 and 9 were special months of abstinence, and there were no weddings or large celebrations held in these lunar months. Satsuki was the month of planting the rice fields and thus the god of the fields was welcomed back from his retreat in the mountains. This also was a time for abstention or abstinence. "home of the women" or "day of the women". The girls lived in a special house with iris and mugwort hung from the eaves to ward off evil. "wrapped in rain" or "abstinence during the long rain period". During the whole of the fifth lunar month, couples had to be abstinent (and use their energy for planting rice).
. imi 忌み / 斎み imi .
. shinguu shingū 新宮 Shingu "new shrine" . 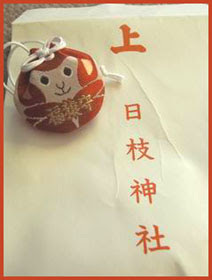 the fifth day of the fifth lunar month. The change from the lunar to the solar calendar brought some difficulties in keeping the season. 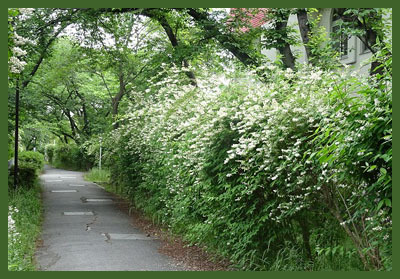 Some of the kigo are placed in EARLY SUMMER, some in MID-SUMMER. Tango no sekku is a traditional Japanese event observed on May 5th as a celebration for boys' talisman and health. Families including boys observe it, displaying yoroikabuto (an armor), gogatsuninngyou (dolls for the Boys' Festival), or koinobori (carp-shaped streamers). Although this tradition has continued to this day, after World War May 5th started to be called "children's day". It is observed as a holiday recognizing children's (boys and girls) happiness. Tango no sekku was originally a custom brought from ancient China. In China, May has long been regarded as a month of evil spirits. So events for driving them away were widespread in May. At first, this special day was not always on May 5th, but eventually it settled on the day. As for Japan, during the Nara period (710-794) five seasonal events (jinjitsu, joushi, tanogo, tanabata, chouyou) were introduced. At that time, the five seasonal events were observed by aristocrats as important events to ward off one's own sins during the turning point of each season. And then, they spread to the samurai (warrior) families. 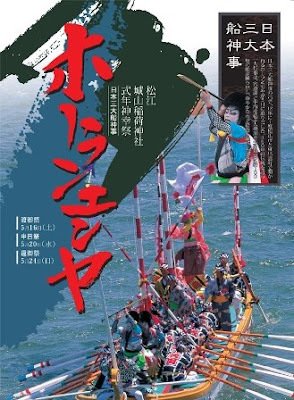 During the Edo period, since the feudal government designated May 5th as an important day, it also became popular among common people, and it came to be observed widely in Japan. ayame no makura 菖蒲の枕 (あやめのまくら) "iris pillow"
at the imperial court, iris were put into the pillow to ward off evil influence. First for a boy just born the year before. reminded the samurai of their swords. 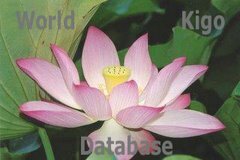 The iris flower is seen in present-day July, and many related kigo are placed in "mid-summer", see below. These dolls and warriour helmets are decorated for the Boys Festival. They are a precious family treasure, often given by the grandparents when a boy is born.
. 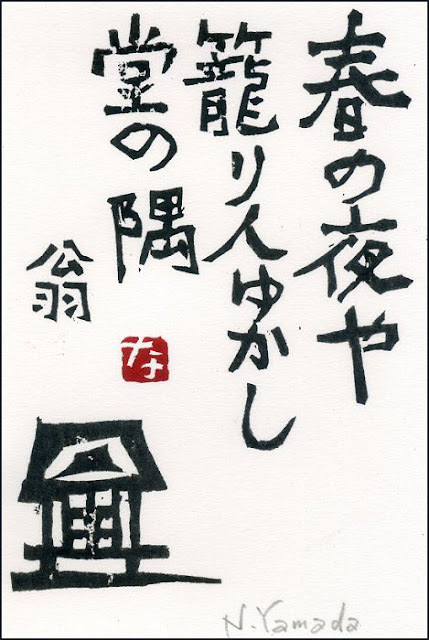 Dolls and Haiku . Yomogi mugwort (and ayame iris) were known to ward off evil and protect from disease, and placed at the gate of homes for protection. 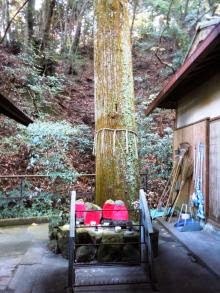 To thatch the eaves or hang up protective plants under the eaves has been a custom since the Heian period, done on the night before the fifth day of the fifth lunar month. 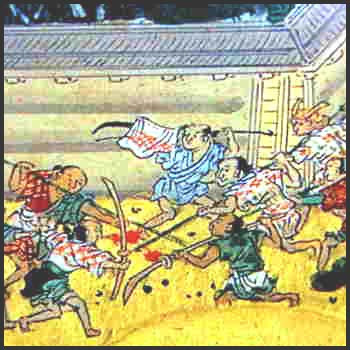 It later spread among the samurai and then townspeople. Adding mugwort or chinaberries or wild water oats (makomo) is especially effective in warding off the diseases of the coming summer. a small wooden sword for boys to war on the festival day. Sometimes leaves of the iris flower were used. 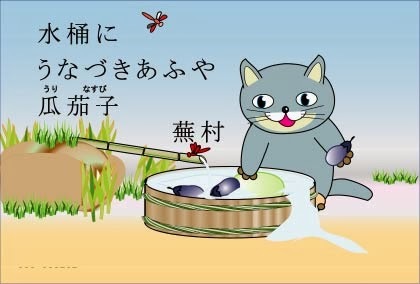 A game for children on the festival day. The leaves of iris are woven to a rope which is then hit on the ground. The boy who produces the loudest sound wins the bout. This is also done to prevent evil influence and disease to befall the children. A game enjoyed by the aristocracy since the Heian period. The person with the longest and thickest roots of an iris is the winner. During the ceremony poetry was recited, sometimes with two groups rivalling for the win. Children made two groups down by the riverbank (the Kamo river in Kyoto) and started throwing small stones at each other in a mock battle, sometimes iris flowers in some kind of exorcism ritual. 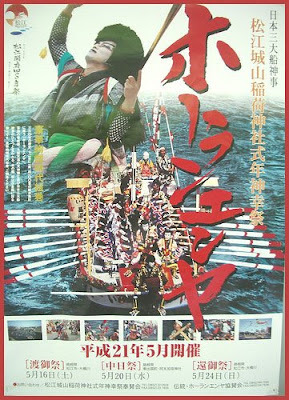 It was also performed at the Heian court, but grown-ups got really serious and hurt each other, so it was ablished soon. The shavings from willow branches are added to the armour of the warriour decoration. Iris on the morning of the day after May 5 had been soaked in dew, the "water of gods" (神水), and these flowers were especially powerful to protect the humans from evil influence. These auspicious plants were not only put on roofs and under the eaves, they were also word around the waist to protect the people. 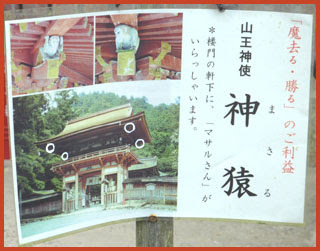 A board made from peach wood with an inscription to ward off evil influence. It was hung up ath the entrance to a home. There is an old Chinese saying, that when an owl grows up, it will eventually eat the mother bird and then fly off. The owl was disliked because of this behaviour and in some area an owl was nailed to a tree to die on the day of the summer equinox. This is a symbol for unfilial behaviour. In China, on May 5, the meat of an owl was put into hot soup and given to the young boys. In Japan this kind of soup was also given to warriours in a battle. The owl is also called "bird that eats its mother" 母食鳥.(hahakuidori). 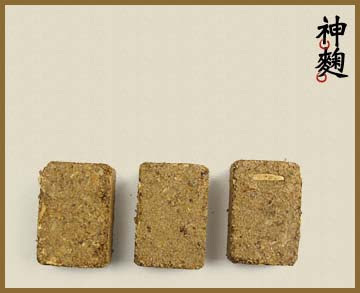 They are made from rice yeast (kome kooji, kiku 麯), wheat flour, liquid from a special plant of the chrysanthemum family, which has leaves looking like carrot leaves (kawara ninjin　河原人参). This mix is supposed to bring good health in the hot summer months. This famous samurai from Kumamoto was often decorated in paintings or as dolls during the Boy's Festival. 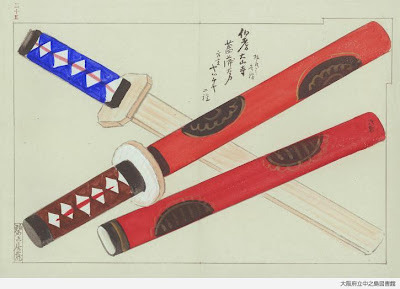 This is hokku is from the 4th month (May) of 1811, when Issa was in the area just east of Edo, a week or two before the Tango or children's day festival on 5/4 and 5/5. The plant the sparrow is trying to pull to its nest is a sweet flag, also called calamus. Its long, bright green leaves resemble iris leaves, causing the plants to be easily confused, although sweet flag flowers are much more modest than iris flowers. 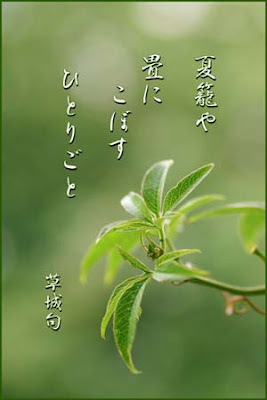 In fact, in modern Japanese ayame means iris, although in Basho's and Issa's time it meant sweet flag. 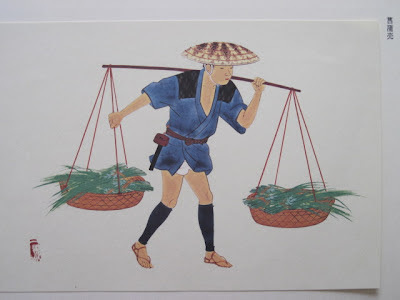 The leaves of the sweet flag were once consumed in many areas of the world as an herb that was believed to help protect against disease, and in Japan sake with stalks and leaves of sweet flag soaking in it was drunk at the festival. On 5/4 people would take hot baths in water with sweet flag soaking in it in order to increase resistance to the plague and other summer epidemics. In this hokku it is a sparrow which wants very much to pull a sweet flag to its nest, as if it wished to protect its nest from disease. It might be a small sweet flag that is still growing. On the other hand, Issa may be imagining a scene from 5/5 based on a memory from the past. If so, then the swallow has its nest in the eaves of a house, and now, on 5/4, stalks and leaves of sweet flag have been placed here and there on the edge of the roof so that the plants stick out over the eaves, thus symbolically protecting the house from disease. Seeing the sweet flag plants, the sparrow tries hard to pull a leaf or the whole plant (or perhaps several plants) to its nearby nest. The plants are not part of the roof but are generally placed on top of the tiles, board shingles, or thatch. In the case of a thatch roof, the stalk might sometimes be stuck into the bottom edge of the straw thatch. A diligent sparrow, however, might be able to move a sweet flag a short distance. Issa seems impressed by the parent bird's energetic efforts to use the herb as part of its nest, as if it could sense the herb's protective powers. The Japanese government calls 5/5 Children's Day, correctly reflecting Japanese history, although the 5/5 festival is often referred to somewhat incorrectly as the Boy's Festival, a concept that took root within the patriarchal warrior class headed by the shogunate in the 17th-19th centuries. Warrior families displayed life-sized and doll-sized swords and other weapons as well as suits of armor, and the warrior class looked on 5/5 as the day as the day to celebrate future warriors and to hold contests that would display feats of skill by adult warriors. 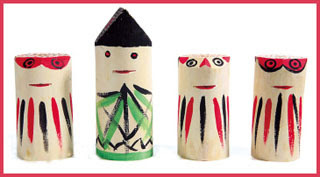 This became the prevailing style in Edo, but in many parts of Japan the festival was a day to fete all children. The other part of the festival, which began on 5/4, was for adults, especially women, as well as for children. It was the day of purification with sweet flag in many forms, and it was often called "Women's House," since in many areas women were regarded as the owners of the house on 5/4, and men stayed outside while women purified themselves and their houses. 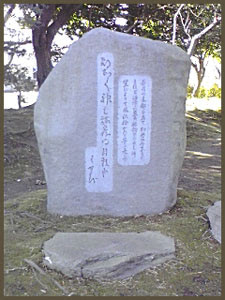 In Issa's time the festival took place about a week before the summer solstice and soon before rice planting, so it is believed by many scholars that earlier in history women engaged in many shamanic practices, including singing sacred songs in seclusion from men, in order to protect the village against disease and help the village's rice to grow vigorously. This seclusion and purification period was also the time when women prepared for the rice-planting festivals that would soon take place in the new paddies. In Issa's time shamanism had become less important in village life and was largely a matter of custom, but many people still continued to believe in the power of sweet flag and other herbs to purify and protect themselves and their houses.